The site of the Temple of Artemis at Ephesus in Turkey: Some stacked remnants recreate columns, but nothing remains of the original temple. Currently, a stork nests on the top of the column. The Temple of Artemis (in Greek — Artemision, and in Latin — Artemisium), also known as Temple of Diana, was a temple dedicated to Artemis completed around 550 BC at Ephesus (in present-day Turkey) under the Achaemenid dynasty of the Persian Empire. Nothing remains of the original temple, which was considered one of the Seven Wonders of the Ancient World. I have seen the walls and Hanging Gardens of ancient Babylon, the statue of Olympian Zeus, the Colossus of Rhodes, the mighty work of the high Pyramids and the tomb of Mausolus. But when I saw the temple at Ephesus rising to the clouds, all these other wonders were put in the shade. The Temple of Artemis was located in the ancient city of Ephesus, about 50 km south from the modern port city of Izmir, in Turkey. Like the other wonders, Antipater chose the temple for his list not only because of its beauty or size, but also because it rested near the border of the Greek world. This inspired a sense of mystery and awe for the Greeks, and emphasized Alexander the Great's vast empire. Artemis was the Greek goddess, the virginal huntress and twin of Apollo, who supplanted the Titan Selene as Goddess of the Moon. Of the Olympian goddesses who inherited aspects of the Great Goddess of Crete, Athene was more honored than Artemis at Athens. At Ephesus, a goddess whom the Greeks associated with Artemis was passionately venerated in an archaic, certainly pre-Hellenic icon. The original—of which many copies and reductions circulated in Antiquity— was carved of wood, with many breasts denoting her fertility (rather than the virginity that Hellene Artemis assumed). 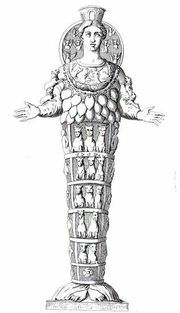 Most similar to Near-Eastern and Egyptian deities, and least like Greek ones, her body and legs are enclosed within a tapering pillar-like term, from which her feet protrude. On the coins minted at Ephesus, the many-breasted Goddess wears a mural crown (like a city's walls), an attribute of Cybele (see polos). On the coins she rests either arm on a staff formed of entwined serpents or of a stack of ouroboroi, the eternal serpent with its tail in its mouth. Like Cybele, the goddess at Ephesus was served by hierodules called megabyzae, and by ( korai). A votive inscription mentioned by Bennett (see link), which dates probably from about the 3rd century BC, associates Ephesian Artemis with Crete: "To the Healer of diseases, to Apollo, Giver of Light to mortals, Eutyches has set up in votive offering (a statue of) the Cretan Lady of Ephesus, the Light-Bearer." The Greek habits of syncretism assimilated all foreign gods under some form of the Olympian pantheon familiar to them, and it is clear that at Ephesus, the identification that the Ionian settlers made of the "Lady of Ephesus" with Artemis was slender. The Temple was designed and constructed around 550 BC by the Cretan architect Chersiphron and his son Metagenes. This early construction was built at the expense of Croesus, the wealthy king of Lydia. The rich foundation deposit of more than a thousand items has been recovered: it includes what may be the earliest coins of the silver-gold alloy, electrum. Marshy ground was selected for the building site as a precaution against future earthquakes, according to Pliny the Elder. The temple became a tourist attraction, visited by merchants, kings, and sightseers, many of whom paid homage to Artemis in the form of jewelry and various goods. Its splendor also attracted many worshippers, many of whom formed the cult of Artemis. The temple of Artemis at Ephesus was destroyed on July 21, 356 BC in an act of arson committed by Herostratus. According to the story, his motivation was fame at any cost, thus the term herostratic fame. "A man was found to plan the burning of the temple of Ephesian Diana so that through the destruction of this most beautiful building his name might be spread through the whole world." That very same night, Alexander the Great was born. Plutarch remarked that Artemis was too preoccupied with Alexander's delivery to save her burning temple. Alexander later offered to pay for the Temple's rebuilding, but the Ephesians refused. Eventually, the temple was restored after Alexander's death, in 323 BC. Over the next two centuries, the majority of Ephesians converted to Christianity, and the Temple of Artemis lost its religious appeal. Christians tore down the remenants of the temple, and the stones were used in construction of other buildings. 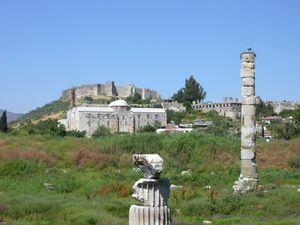 The main primary sources for the Temple of Artemis at Ephesus are in Pliny the Elder's Natural History XXXVI.xxi.95, Pomponius Mela i:17, and Plutarch's Life of Alexander III.5 (referencing the burning of the Artemisium). The site of the temple was rediscovered in 1869 by an expedition sponsored by the British Museum led by John Turtle Wood, and while several artifacts and sculptures from the reconstructed temple can be seen there today, as for the original site, only a single column remains from the temple itself. The Temple of Artemis housed many fine artworks. Sculptures by renowned Greek sculptors Polyclitus, Pheidias, Cresilas, and Phradmon adorned the temple, as well as paintings and gilded columns of gold and silver. The sculptors often competed at creating the finest sculpture. Many of these sculptures were of Amazons, who are said to have founded the city of Ephesus. Athenagoras of Athens names Endoeus, a pupil of Daedalus, as the sculptor of the main statue of Artemis in Ephesus. The Temple of Artemis was located at an economically robust region, seeing merchants and travellers from all over Asia Minor. The temple was influenced by many beliefs, and can be seen as a symbol of faith for many different peoples. The Ephesians worshipped Cybele, and incorporated many of their beliefs into the worship of Artemis. Artemisian Cybele became quite contrasted from her Roman counterpart, Diana. The cult of Artemis attracted thousands of worshippers from far-off lands. They would all gather at the site and worship her.